Env. issues are the largest (and simplest) causes of losses of Guppies: NEED a cycled/stable system of at minimum ten gallons volume, with clean (little metabolite), hardish, alkaline water of NO Ammonia or Nitrite, 10 ppm or less NitrAte. Cool temp. (low to mid 70's F0, frequent partial water changes. I have a question for you about a guppy of mine with a curved spine. Back-story: This is my 150L community tank. I admittedly have been a terrible tank owner of late (16 hour days at Uni with a 3 hour commute will do that. Sigh). was around .5ppm and pH was off my test's scale - some maybe 8 or more). This was a week ago and I have since done a few water changes and added stress zyme and bio booster (after the first water change the ammonia reading was higher but nitrite is now at trace amounts). When the dwarf started looking really bad I treated with ammo lock, but I ended up losing him anyway (probably helped along by the fact that the Bristlenose Pleco started munching on him!). I'd lost a few guppies (at least 3, maybe one or two more, I honestly am so scatterbrained I can't recall how many I had before leaving) at some point whilst I was away but did not notice in my inattentiveness. Yeah, I feel like a pretty terrible person right about now. My thoughts are that the lack of gravel vac-ing was the reason for the ammonia spike? I hadn't added any stock for months (and have no plans to replace the deaths) and over feeding certainly wasn't the issue. (even after turning the heater completely off during the day), but I figured that was not a trigger. how that can be contagious and how you should euthanise the fish if you see it. So I was hoping you guys could give me some guidance on how to identify the cause and how best to proceed with her. I have had my guppy tank (5 gal) for about 2 years and everything has been fine. Recently, my female guppies get this condition where their belly gets constricted looking (making their gills look extra big) and they eventually die. When the first one died I thought she was just old since nothing was going on with the rest. I have now lost 2 and my best female is showing signs of this now. The males are fine and thriving (and from looking for this condition found I have an improper male to female ratio now). Back again!!! Sorry to bother you once again but I am at my wits end with my tank! I have a 26 gallon tank running two filters, one is the one that came with the tank and I added a second for a ten gallon just to add surface for good bacteria. It has one tower decoration, one pirate ship and one treasure chest, all bought at PetSmart, two Marimo( may not be spelling this right) balls and four fake plants with what I felt were soft leaves. I had done a fishless cycle that was removing ammonia and nitrites quickly using pure ammonia and so I did a large water change and added 4 male sunrise tequila guppies. I was having nitrite issues after that but never ammonia issues so I do water changes almost every other day and use Prime and water conditioner every time but to no avail! Still having them. In the mean time I acquired two Mickey Mouse Platys. and using Prime but no luck. It's been two months and now for the main reason I am writing. One of my guppies top fin looks ragged with white tips and I know water conditions can bring on fin rot but I also believe he may have been bullied a little although most of the time they seem to get along. Then tonight maybe it's paranoia but on of my platys looks kind white and maybe it's eyes look a little buggy so I ran out and got Maracyn 2 because the booklet said if she showed a decrease in movement it was the one I should choose. I am too afraid to set up a hospital tank and am afraid to break down my main tank for fear I will be starting over the cycling process, not that I have ever really completed it anyway. What am I doing wrong and how in God's name do I proceed from here? I'm so frustrated! By the way, tank temp is at 82 and have floated frozen water bottles to cool it down to no avail, which may be good since I have this bacteria but will invest in a chiller if I don't give up all together soon. I love them and don't want to have them suffer so any suggestions would be gravely appreciated! Thanks! <Don't panic, or get too bummed... Time will solve this issue assuredly. I'm Madd, I'm 13 and have had Guppies for about 3 years now and I've never had this problem with one of my fish before... Let me give you a couple of statistics on my tank before I go on about my Guppy. which grew to be about three inches and was very non-aggressive, only munching on dead Guppies when it got to them before me. and is always at a steady 80 degrees which through research I have heard is the best temperature for Guppies. so I am cleaning my tank ASAP. which again should go down when I clean my tank. Total hardness level is 300, which is 'very hard' according to the test strip. Alkalinity is 300, which is high. I'm not positive what alkalinity is and what it does in the tank per say. Oh yeah, and my P.H. is 8.4 which according to the test strip is alkaline and from what I have read is moderately safe since guppies can take a P.H. up to 9. Alrighty, on to my fish. A couple of days ago (less than a week) I got a male Guppy from PetSmart thinking for it to add some color to my tank. I let him float in the water in the plastic bag for the usual 30 minutes before I let him out to swim with the other fish. Since then all has seemed fine. I check on my fish just about every time I walk in or out of my room, since my tank is sitting on top of my dresser, and about an hour ago when I glanced in to check on my fish I noticed my new Guppy laying on his side on the gravel. I looked closer thinking it was dead but just making sure, and to my surprise I saw the fish breathing hard (gills moving faster than normal) and his side fins were going. I also noticed that his tail, which had been perfectly fine earlier, was missing a large chunk, almost appearing to have been bitten off by other fish (which wouldn't surprise me much, because they tend to nibble on each other's tails, but definitely not to this extent!). Immediately I went into action, putting the fish into a separate bowl in case it had a disease. When I moved it to the other container it attempted to swim, but ended up vertical (head up) with it's back tail unmoving, only using it's side fins frantically before it settled back on the bottom on it's side. Next I began Googling what it could be, but found nothing but the vague idea that it might be indigestion or constipation since the fish floats at the bottom from that. The fish didn't have any protruding scales and all seemed normal about it except it was on it's side. I dissolved Epsom salts in the water with the fish, hoping that would help in the case it were indigestion/constipation and then I went back to Googling. When I next went to check on the fish in question I found him in the exact same spot unmoving and unbreathing. Any ideas of what it could have been? If you'd like I can send a picture of the deceased fish for you. I haven't flushed the fish yet, just in case I should need to look at the fish for any visible symptoms. Any ideas? I'd really like some clue here! Thanks so much WWM crew (AKA the person who's responding to this)!!! 7.0,GH & KH were both zero. pH was not stable and stayed between 6.2- 6.8. Before the fish died, they all hovered in front of the filter and died one by one. After reading Neale's article, I removed the carbon, replaced with crushed coral in a stocking foot, added a coconut shell in. In few hours fish were more active and pH risen to 7. 8 GH 120 KH 75. Water appears brownish and cloudy, but fish appears happier. My question are does the cloudiness go away? chemistry variation. Normally they go away within a few days, but do keep an eye on your fish. In either case, doing a series of small water changes, perhaps 10-20% every 2-3 days, should help things clear up, and rinsing the mechanical media in your filter will dramatically improve things too. Is there such thing as too hard for guppies? I put enough coral to fill the foot and the filter container, is this a lot? When do I replace the coral? Does fish behavior suggest cause of their death was the acidic pH? I like to purchase more and I just want to make sure they make it this time. Thank you! Your site is awesome and thank you for all the info once more. I removed all the gravel few weeks ago after most of the fish died; so, aside from few plastic plants, power filter, heater and UV sterilizer there is nothing else. Today, I removed half of the coral out of the filter as you suggested. and pH and hardness higher, I may have better chance to have more males. You are a great resource. I have learned more from you than 5 books I purchased earlier. Why don't you write one? How does the tank cycles if the only media in it is crushed coral? If I washed the crushed coral under hot water every 2 weeks, would that also not kill the good bacteria? What is floss, does it looks like scrub pad? If so I have that on in the hang Is that it? If not let me know, I 'll go and get one. Is that enough to keep the bacteria colony cloned every 2 weeks? Hi, I wrote to ask a few questions on my guppies. Lately I notice that they have lost their colours and even the females have suddenly gotten aggressive and attacking other females. for the past couple of days because I noticed that their gills have redden and on of the males fin is not opening properly anymore. I thought it was fungus or maybe white spots so I went to the shop and bought the medicine for that. Unfortunately the LFS around my area doesn't sound as professional as those around these people I see that were asking for advice. When I ask them something...they just treat it nonchalantly. I am thinking that they just want me to come back and buy more fish. Anyway, you site have helped me a lot in trying to understand my guppies behavior and I am very grateful of that. But when I keep seeing my guppies deteriorating like that I am so heart broken. I wish I know exactly what's wrong with them. I cannot find anything that can test for ammonia levels or nitrate...only tester I saw was for chlorine. But with reddish gills I'm guessing ammonia poisoning. 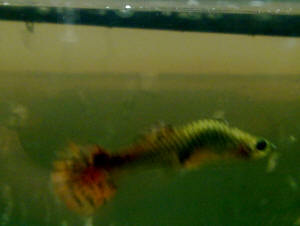 Does it mean that future is bleak for all my guppies when they losing their colours and females getting aggressive? Thank you for any help that you can give me. I am really desperate right now. Well first of all, hello. So I have a 15.6 gallons fish tank with heater and filter. I've had this tank for about two months now and I had a rather shaky start. I started out with 3 guppies (1 male and 2 females) Unfortunately, the male died within a couple of days. Later, one of my remaining females had babies (about 20 of them) and got pretty vicious. She injured my other female who then got cotton-like fungus. I bought a treatment and it worked but most of her tail was gone so she died in a couple of hours. The last female died too. She had red pots all over her body and her tail seemed to be shrinking or something and had a brown line all around it. I stopped putting salt after I put in the Corydoras. Should I start again? Later on, I bought 4 ghost shrimps. I thought the would be eaten but no all of them are still alive. I also bought an apple snail but it died within a few days (I'd like to know why). (Sorry my native language is French and I don't know their name in English but they're snail eating fishes. Yes. Snail problems). When they arrived, the black tetra's ate one of the 6 remaining baby guppies, so I put them in a breeding net. another one died, probably killed by another baby. So I now have 4 remaining (and an adult one my sister bought because she though he was gorgeous). 2 of the babies are pretty small and the other 2 have gotten pretty big. One of the big ones started chasing the smaller ones around so I decided to put him/her (pretty sure it's a her thought) out of the net and into the tank. It went rather well, still alive after a week but the black tetra's are getting rather insistent about their nipping (they don't chase her around but sometimes it looks like they attack her though they don't really do so viciously) Could they be more aggressive when hungry? So, since they seemed to be chasing her a little more, I decided to put her back in the net and see if she would be aggressive again. But the moment I put her in the net, the other big baby guppy (Almost sure it's a male that one. He got very colorful while the others only begin to show colors) stared at her for a while then started an obsession with her and wouldn't leave her alone, so I put her back in the big tank where, at least, she isn't constantly followed and nipped at. So I'm now wondering if he's just aggressive. He doesn't seem to be attacking either of the smaller fishes. So my question is: why does he act that way (sorry about the maybe not so useful information above. It's just in case)? Should I buy another breeding net (one that I can separate in sections) or just wait see? Sorry if there are grammar mistakes but English isn't my native language so I sometime have some difficulties with it. Thank you for taking the time to read. <Not a problem. Please do write back if you have any more questions after reading. Re: Guppies Dying 7/25/07 Hi Tom. <<Hello, Carrie.>> My fish were doing better for a week after the water change. The fry were happy and nourished. But I am still having a problem. The alkalinity is still off. I bought some pH increaser (haven't found the crushed coral) and it increased the pH (from 6.4 to about 7) half a point - but it didn't seem to help the alk. too much. I will put more in in the morning and see if it helps more. <<Actually, Carrie, the pH adjusters arent really the best way to go which is why I suggested the crushed coral. Most often, at least in my experience, there are multiple products/steps to raising both pH and alkalinity - simultaneously - with these. Water changes become problematic, or at least costly, since the product(s) have to be added back in with the fresh water to maintain proper levels. Hardly insurmountable but it sure tends to make things more tedious for the hobbyist and, frankly, not what I would recommend. I say this because part of what I perceive my responsibility to you to be is making life easier, not more difficult. You ask what time it is and I tell you how to build a watch. That smacks of arrogance, which I happen to detest, and doesnt help you a bit. (From a strictly self-serving standpoint, that would make my response a waste of my time as well as a waste of yours.) ;) >> I came in two days ago to find my male guppy floating, and today I found my mamma guppy and a fry floating. <<Cant say that I enjoy hearing about that, Carrie. Im sorry.>> Is there a reason that some will float to the top and some will drift to the bottom? Maybe some from chemicals and the others from illness? I just found it curious that the first few guppies that died were on the bottom and these were on the top. <<The cause of death is certainly an issue here. Internal bacterial infections can cause gases to build up in the fishs system. This, quite logically, would lead to the fish floating to the top of the tank when it expires. If the death were related to chemical poisoning, for example, there would be less chance of bloat such as what you might find with a swim bladder problem and the fish would tend to sink. Since the latter problem could potentially lead to the former problem, I dont suppose Im that surprised that youve seen both cases in your tank. (Id prefer that there were no cases of either! )>> After this, I did a 25% water change. <<Not a bad precaution to take.>> I am still looking for a home for the Pleco. I don't want to just kill it. <<And I dont want to see you do this.>> I may take it back to the pet store and see if they want it back. <<Many will if the fish is in good health. The LFS I patronize will occasionally hold healthy fish while a hobbyist does battle with a problem in his/her display tank. Typically this if for large, SW (read that as expensive) livestock but, there are dedicated business people out there who actually put aside their cash registers for the betterment of the hobby. (Now you know why I do business with these fine folks. )>> I am also thinking about maybe changing the type of filter that I have to a type that has inserts for health. It is the AquaClear Power filter. What do you think of this idea? <<Up until a few years ago, I used these filters exclusively. Still have one running on a 20-gallon tank and two more that Im holding in reserve (one for a QT). I like em.>> Thank you so much for your help. I will be in touch soon. Carrie <<Always happy to help, Carrie. Look for the crushed coral online if you cant find it locally. Its a popular product that cant be too hard to locate. (Theres another route we might investigate if all else fails.) Best regards.